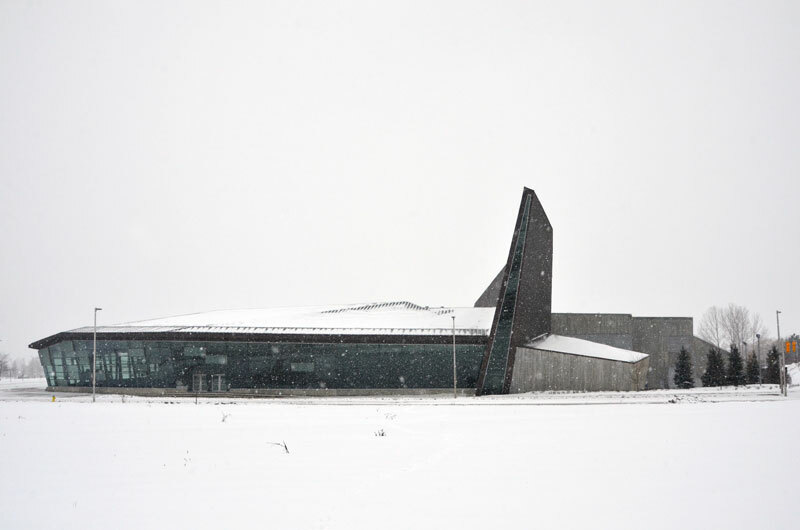 If anyone was left wondering what the War Museum in it’s entirety looks like after my previous Deconstruction post I’ve book-ended this one with two different full views and included a few images I haven’t yet posted. As always you can click on the images for a larger view. Impressive building that works perfectly with the surrounding terrain. A very thoughtful integration, I agree. wow Karen! I love these images. Architectural photography – I would love to see more of it from you!! These images are so Star Wars-inspired!! Love love – where is that LOVE button? I actually find architectural photography a very creative and enjoyable endeavour. Thanks so much Marina. I’m looking forward to more architectural photos from you – you’re really great at taking them. I see what you mean, the overall shape of the museum being rather spaceship like. I hadn’t picked up on that. 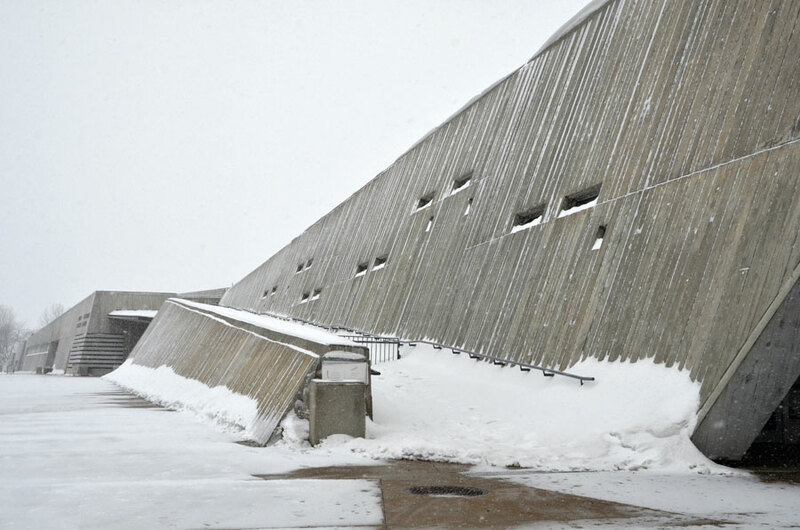 It really is like those WWII military bunkers on the coast of Europe: slab walls and slit-like windows. That must have been intentional! Yes, intentional and the slit windows flash Morse code when it’s dark enough. “lest we forget”. Well, thank you! The Morse code is a fantastic idea; it is great to discover that sort of hidden secret. Yes– long and low on the horizon, just a thin, dark, cold cement strip– a very poignant visual statement about war. And as usual, your photos let me see it. Lovely shots of an amazing bit of architechture. 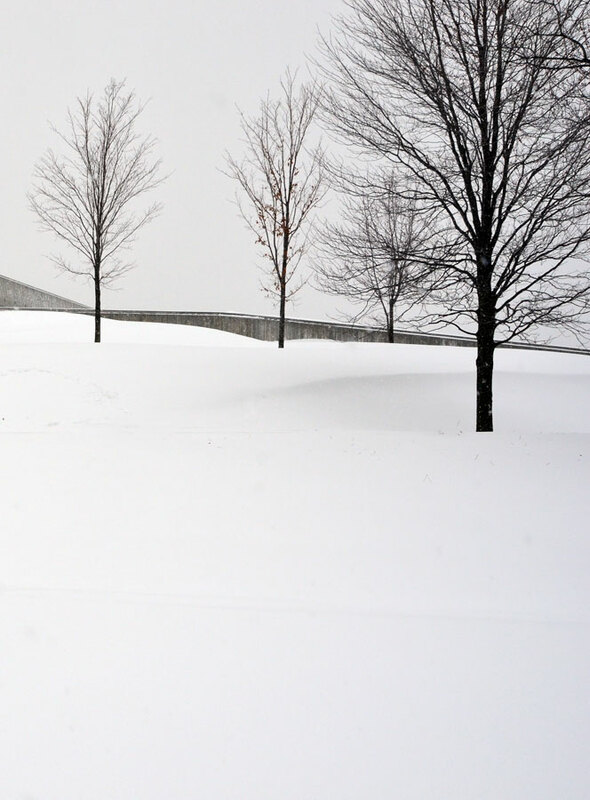 The snow just makes it seem more somber and isolated, very evocative of the feelings of war to me. Thank you wicker, I agree it is lovely but sombre. Yes it is rather sprawling. 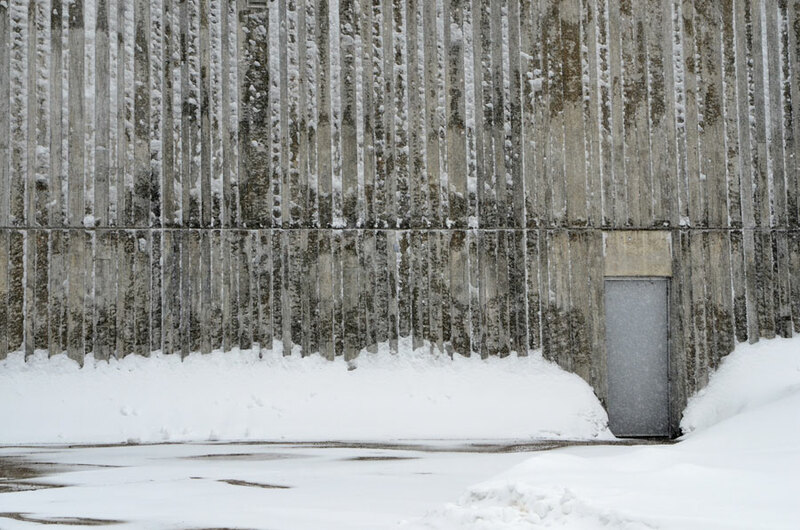 It’s a cold and somber place… you’ve captured it perfectly. Thanks for posting these Karen I was indeed wondering 😉 The idea of the morse code and Lest We Forget is very moving. I like all the though out details in this building and the Morse code is a great detail. Again, great photos! Numbers 3 and 9 show a real nice play between the snow and the concrete. Steve, thank you, I truly look forward to more of your work! that is an utterly depressing building. Am I a philistine to say I HATE modern architecture? Personal taste is acceptable and highly encouraged! That’s what makes life so interesting. I love a lot of different architecture including this building and much modern architecture in general, but certainly it does provoke mixed feelings, as does war. I’ve photographed it on a sombre day because I think it works with the building and what it commemorates. You are the magician to lead us (or our mind) to unknown endless space. And make the people loose a word. Very few photographer can show the time and the space beyond the image. You are the one of that few. Ah Yoshizen you are too kind. I am happy you feel that way about my work. Thank you. Living in Australia, I’ve always had a romantisized view of countries that receive snow. For me, landscapes painted in white were beautiful; evocking memories of Christmas, family and walks through snow covered forests. As a kid we visited my uncle in Germany a couple of times over the festive season. A number of your pictures in the last few months have had a solitary and lonely quality; beautiful, but still solemn. I forget sometimes that winter can be also be quite desolate too. I’m still loving the pictures though Karen; haunting and beautiful. Sorry to be downer Distan. I love winter actually but it does tend to bring out a certain aesthetic, or maybe that’s what I go looking for. I’m glad you still appreciate them. Oh no, not a downer at all. I love winter too! In fact summer is my least favourite season, so autumn and winter can’t come soon enough down here. Your images just serve to remind me of how humbling mother nature can be; and despite our technology – whether that be through buildings, boat moorings, or hessian sacks for pine trees – we are still at her mercy. Your compositional eye is inspirational. Quite a bit of snow but not as much as some winters. Your snow doesn’t seem to last to long Nandidni. 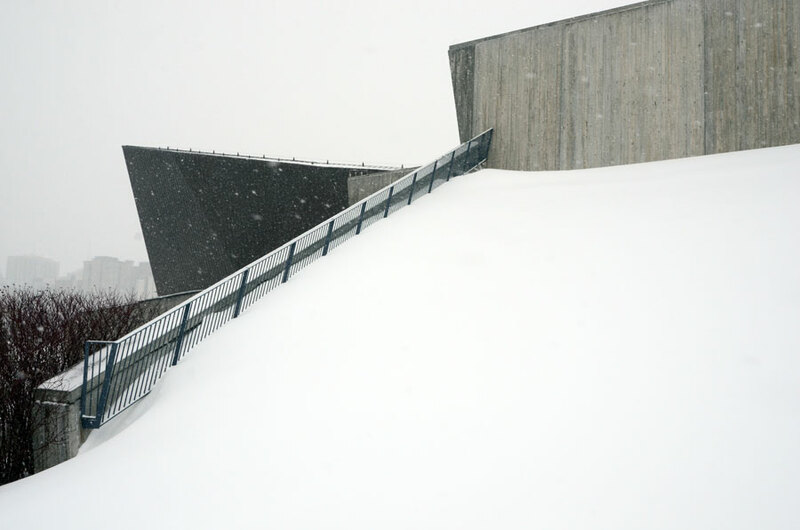 Cool photographs of cool architecture. Glad you like them Allen! 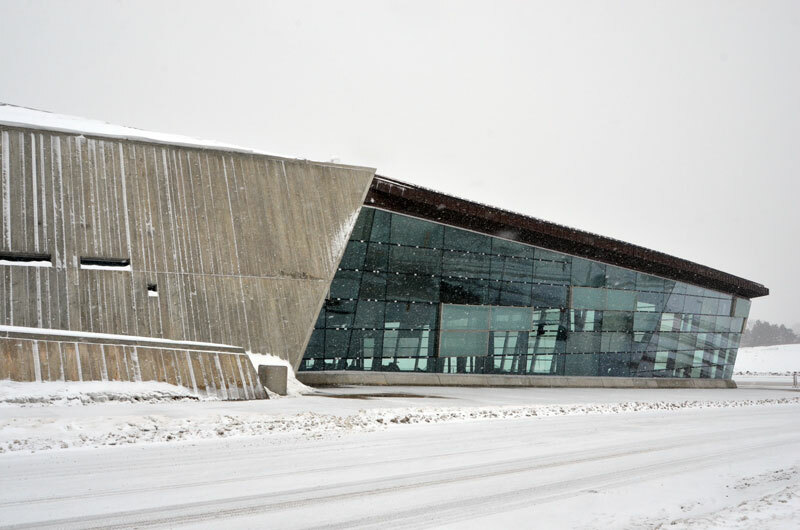 The design of the museum is very fitting to its subject – love it! I think it was mentioned above, but the concrete detail does resemble a bunker…which was nicely off-set by all of the glass. 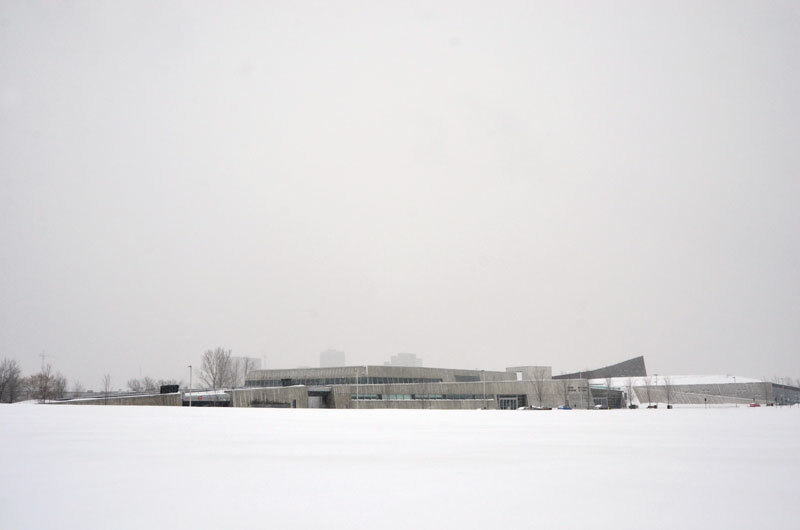 My favorite, though, is the picture with the trees and the snow and the minimal image of the museum in the background. The pristine and stark beauty of the bare trees in the snow has stolen the show…for me, anyway. Beautiful, Karen. It’s funny you mention the trees, I had not put that image in initially and the post seemed incomplete until I added them. I completely get what you mean. Regeneration, it’s what the museum is built on – it’s not complete without the trees. I agree that the set would have been incomplete without the trees…that shot does add something…it must be the regeneration aspect. Very nice…. I love that your photos are outside, looking at, observing from slight remove so that I can also have some objectivity. I don’t think I want to go inside but I am completely fascinated and moved and provoked from this distance. It’s quite beautiful inside too… Your comments are lovely, thank you Anna. 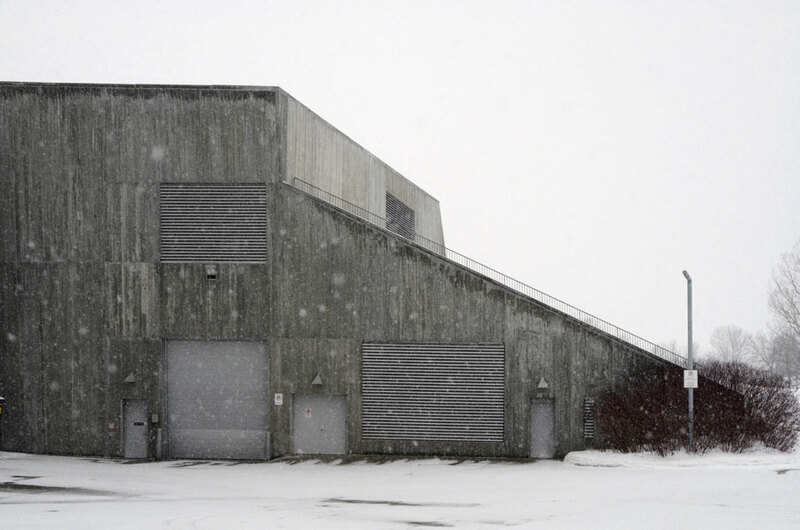 Very clever design, this building blends into its environment so well it practically disappears, yet at the same time makes a real statement about war. The last view reminds me of a crematorium, a powerful message. Great photos by the way, as has been said a few times, you’re good at this architectural photography. You have such an amazing eye for shape and composition. I’m jealous. My partner has a natural gift for photography that I lack. I’ve steered him to your blog for inspiration! Thank you. Thank you very much Gabriel. 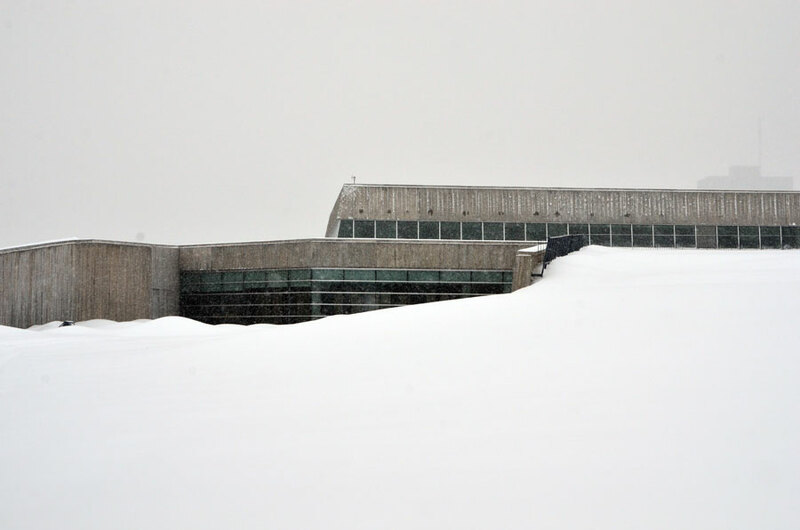 I was at an event at the Canadian War Museum but didn’t take time to view the building itself. I really enjoyed this set of photos as much for the artistry as for the architecture itself. I have been to the war museum a few years back. 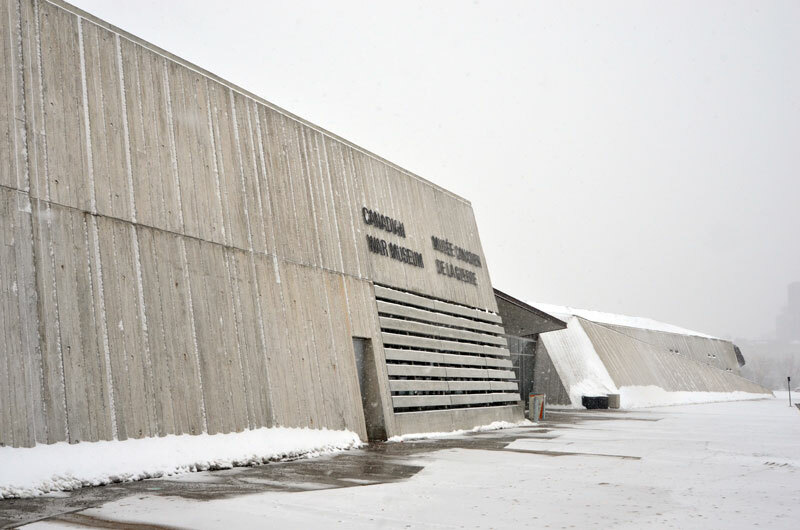 Your photos of the monumental architecture set against the coldness of our Ottawa winters, really speaks to me at a different level about the cold and stark nature of war, period. Also, like the previous commenter, Lynne, when visiting the museum. my wife and I focused on the interior exhibits, and didn’t even really notice the exterior form of the bldg.Thanks for this post. Thanks for your comment, Bruce. It is an incredible piece of architecture, I think. An exceptionally thoughtful building. Nice collection of graphic photos. One gets a sense of the building as part of the landscape. Thank you, Simon. 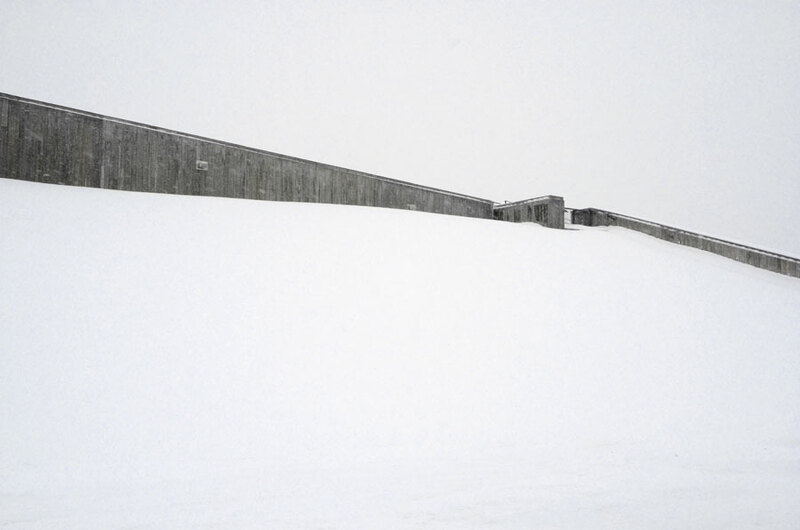 Yes, It is quite purposeful that it blended into the landscape from the back in particular. I’ve been meaning to photograph this building in the summer!